It’s almost time for Bruce Buffer to tell New York it’s time, for the first time. It’s been 21 years and 198 numbered events since the promotion’s last visit to New York when Buffer’s half-brother Michael announced the UFC 7 card headlined by Ken Shamrock that took place in South Toronto. Oops, I meant to say Buffalo, my mistake. Delete key isn’t working. After all that time, after all the ridiculous legislative discussions, votes and non-votes it is finally happening. 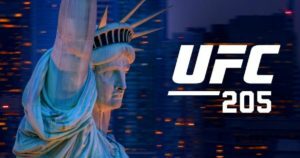 The world’s biggest MMA promotion returns to the Empire State, making their promotional debut in the greatest city in the world, at the world’s most famous arena. Too much hyperbole? 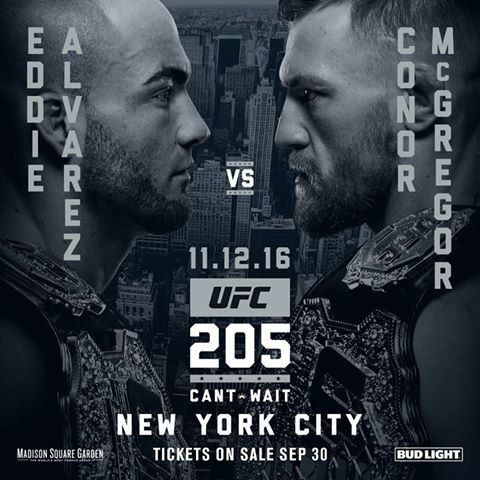 Ok, then how’s this: UFC 205 at Madison Square Garden is coming, and it’s coming soon. The card picture has been cleared up over the last 24 hours with the announcements of both McGregor Vs. Alvarez for the Lightweight belt and Weidman Vs. Romero in a bout that may very well determine who gets the next shot at the Middleweight belt. Those fights are added to what was an already stacked card featuring the two previously announced title fights: Woodley Vs. Thompson and Jedrzecjczyk Vs. Kowalkiewicz. Philadelphia’s Eddie Alvarez has been calling out Conor McGregor since shortly after winning the Lightweight title. How shortly? Well, during the press conference following the fight he asked for “An easier fight, like Conor McGregor.” Wish granted. Alvarez’s first title defense will be against the biggest draw in MMA. Alvarez has said he matches up well against McGregor and will get a chance to prove it. Conor McGregor, a shy, unassuming fighter from Ireland has made a headline or two in the past few years. After a couple of boring fights at Welterweight that nobody watched… ok, the sarcasm ends now. The biggest, loudest name in MMA, who just so happens to be the current Featherweight champion will fight at Lightweight for the first time in the UFC. In typical McGregor fashion, he’s doing it in style getting the immediate title shot against Alvarez. With the huge Irish community in the NYC area, and Alvarez being from a city that gets no love from New Yorkers, McGregor will have even more of the crowd behind him than usual. That may sound hard to believe, but trust me it’s true. There were numerous names tied to this championship bought with Tyron Woodley, but all that is over. With an opponent set the current Welterweight king can now focus on one name. Woodley looked amazing against Robbie Lawler, dethroning him in devastating fashion. Nobody had done that to Lawler in quite a while. Woodley made it look easy. Stephen “Wonderboy” Thompson has gone on a seven fight win streak since his first MMA loss in 2012. the most recent of those victories a unanimous decision, and technical dismantling, of Rory MacDonald being the most impressive. Woodley has more power than Thompson, that should go without saying, but when it comes to striking technique? There are few, if any in MMA with the abilities of Thompson. Strawweight champion Joanna Jedrzejczyk has yet to lose a fight as a pro, but then neither has her opponent, and countryman Kowalkiewicz. This was a fight many had thought would take place in Europe, mainly due to the nationality of the fighters. Instead one of the UFC is putting one of their most dominant champions on a much bigger stage. Kowalkiewicz is undefeated as a pro, this much is true. As an amateur she does have a loss on her record and wouldn’t you know it, that loss came via first round submission to Jedrzejczyk in 2012. Has her experience since then given her a better shot at beating Joanna? She, and we, will get to find out. Former Middleweight champion and native New Yorker Weidman was one of the faces of the UFC’s push to legalize MMA in New York, and now that hard work pays off as he will be fighting just a few miles from his Long Island home. Weidman wants another shot at the belt he lost in 2015 with his first ever loss. It would be hard to argue that he’s less deserving than Dan Henderson, who is getting a title shot at UFC 204. Weidman would have liked to be fighting for the belt on his home turf, but the timing of MMA legalization in New York didn’t allow for that. Instead he’ll be travelling in from Long Island for what may be a title eliminator bout against a game opponent in Romero. Romero may be coming into this fight coming off of a close, controversial split decision win over Jacare Souza but a win is a win and Romero has seven in a row heading into this fight. His wrestling credentials are unparalleled in MMA, with an Olympic silver medal and a world championship to his credit. As an MMA fighter Romero has used his wrestling defensively for the most part, opting to keep fights on the feet where he has proven to be a n incredibly powerful, explosive fighter. Rashad Evans was at one point the only native New Yorker confirmed for the card. Hey, even if he’s from a town that’s half in Canada, it still counts! His fight marks a move down to middleweight after his illustrious light heavyweight career hit an extended rough patch. He finds himself with anything but an easy fight for his entry to the middleweight fray. Tim Kennedy is a man who, it can be (and still is) argued, was one controversial stool away from stepping in to that small group of fighters considered “Serious Title Contenders.” Alas, Kennedy’s strange fight against Yoel Romero at UFC 178 resulted in a loss and he hasn’t fought since, so ring rust might be a bit of a concern. Still, Kennedy always comes into a fight prepared and in taking on Evans has an opportunity against a big name that could move him right back into contention. With Donald Cerrone, ring rust is never a concern. At 205 the Cowboy will be in action for the fourth time in 2016, making it his fourth straight year with four fights. 2016 has seen him move to welterweight and find great success with three finishes. Originally scheduled to face off with former champ Robbie Lawler, Cerrone finds himself facing a much different style of opponent in the wrestling heavy Kelvin Gastelum. Gastelum seems to have his previous weight cutting issues at Welterweight under control, having successfully made 170 his past two fights. The last of those being a win over former champ Johnny Hendricks at UFC 200 in July. Gastelum has faced some solid strikers in the past with mixed results. He now finds himself standing toe to toe with a striker that many would say is on a different level. Even if Frankie Edgar is from the part of New Jersey that’s halfway to Philly, expect the New York crowd to be behind him. The former lightweight champ is extremely popular in the Northeast, embodying a tough, working-class attitude that resonates with those in and around New York. Frankie is coming off a loss to Jose Aldo for the interim Featherweight belt but hasn’t lost in a non-title fight since 2008. Jeremy Stephens? Not local. The Iowa native fighting out of San Diego should fully expect a hostile environment for this event. Stephens is 2-3 over his last five fights but he’s coming off one of the biggest wins of his career, a unanimous decision over Renan Barao in May. Lil’ Heathen has faced, and fought well against, some very big names and even has a win over Rafael Dos Anjos during his time as a Lightweight. Some fighters would be intimidated fighting Edgar in his backyard, but Stephens is not one of them. Former Women’s Bantamweight champion Miesha Tate looks to regain momentum after losing that title in her first defense. To do so she will have to best Raquel Pennington, a fighter she should know pretty well, having coached her on TUF 18. Pennington is on a three fight win streak heading into the battle with her former TUF coach. They seemed to get along well enough during the show, but all that’s in the past and a brawl is in the future. New Jersey native and UFC stalwart Miller comes into this matchup on a two fight win streak, with both of those victories coming since July. A late replacement for Al Iaquinta (who withdrew from the event due to a contract dispute) Miller’s taken on nearly every type of fighter in his career, so shouldn’t be surprised by much Alves has to offer. Another longtime UFC competitor, with over a decade in the promotion, Brazil’s Alves hasn’t fought since his May ’15 loss to Carlos Condit. That loss caused Alves to rethink things and we now see him making his Lightweight debut. Entering a new weight class and spending that much time on the shelf are both issues that can cause problems for fighters, but with an old pro like Alves, one would expect him to show up ready to go. The Tim Boetsch we’ve seen of late is known for bringing it. He might not win them all, in fact he’s lost 3 of his last four, but if he’s fighting, there’s probably going to be a finish involved. He hasn’t had a fight go to the judges for three years. Since the beginning of 2014, Rafael “Sapo” Natal, a Brazil to NY transplant fighting out of the Renzo Gracie Academy in Manhattan, has gone 4-2 with all but one of those fights going the distance. Liz Carmouche has gone 2-2 since losing to Ronda Rousey in the UFC’s first Women’s Bantamweight title fight. Coming off a win over Lauren Murphy. 205 offers Carmouche a chance to get her career firmly moving in the right direction, back towards Bantamweight contention. The undefeated Chookagian comes into this fight off a win, in her UFC debut, over that very same Lauren Murphy. Coming into a fight against a former title contender, she couldn’t ask for a better chance to alert everyone there’s a new contender in the Bantamweight division. 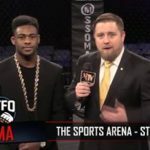 NYC’s Good, a native of Harlem and a veteran of numerous promotions, began his UFC career in victorious fashion with a 2015 knockout of Andrew Craig inside of two rounds. With the showcase at MSG, Good has a huge opportunity to make his mark on the promotion. Muhammad is 1-1 inside the UFC, coming off his first win, a TKO over Augusto Mantano in September. His first loss in the UFC was the first of his career. In Good he has an opponent that should be just as hungry as he is for that 2nd UFC victory.